If Robert McCall is the star of the space artists, then Chesley Bonestell is the Dean of all Space Artists. In fact, many of the current crop of space artists will tell you that Bonestell was a major influence on their career and their work in the genre. While Bonestell was well known for his work imagining the landscape of our Moon and planets within our Solar System, he was also noted for his work during the early years of space flight research. "CONQUEST OF SPACE" by Willy Ley was illustrated by Bonestell and proved to be a seminal work that provided the layman of the 1950s with a serious understanding of the possible future of space travel. Published in 1949, CONQUEST OF SPACE was one of the first books to contemplate manned space flight in Earth orbit and to the Moon. While Willy Ley discussed the facts of space travel, Chesley Bonestell conveyed the visual aspect of flight into outer space. Bonestell was involved in painting space flight subjects throughout the 1940s and in 1947 sent a series of painted studies to PIC magazine for a proposed article on space flight in the future. 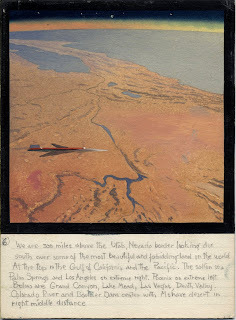 The article told the story through paintings of a ballistic transcontinental rocket trip from New York to San Francisco in less than an hour. 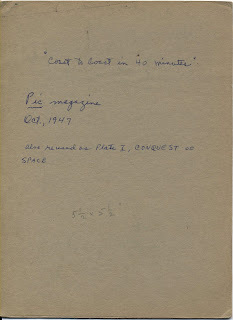 The story was titled "Coast to Coast in 40 Minutes" and was published in October, 1947, just ten years to the month before Sputnik was launched into orbit. 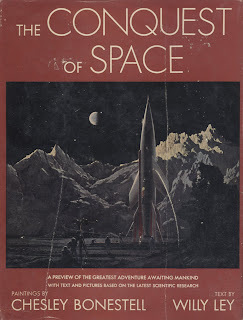 In 2007, I was able to procure the entire series of finished studies that Bonestell had sent to PIC magazine pitching his article on a passenger rocket flight from coast to coast. The report was based upon Tsien Hsue-Shen's (one of the founders of JPL and later became the Father of Chinese Rocketry) theory on space flight into the edge of space. The paintings were painted on illustration art board. Bonestell completed the paintings even to the point of varnishing the surface to protect each work. Then he forwarded them to the publisher of PIC for their review. Bonestell even wrote a basic description in his architecturally trained handwriting of what each work represented on the base of each painting. 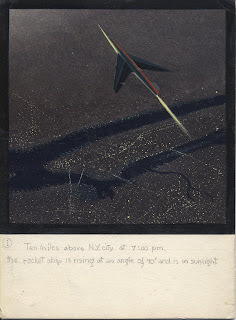 In the case of this first painting in the series of a passenger rocket lifting off in at 7:00PM in the evening from a launch site near New York City. Bonestell used his vast knowledge of architectural rendering and matte painting to meticulously show Manhattan Island, the surrounding boroughs of New York and New Jersey coast with the rocket in the foreground on the beginning of its westward journey. The second painting in the series shows the passenger rocket ten minutes into its travels over Pennsylvania. The viewer is looking north towards the Great Lakes and Canada. Look closely at the lower right hand corner and Niagara Falls, the lights of Buffalo, NY and Toronto, OT in Canada come into view. At the far left, Detroit's lights are coming on as nighttime approaches. Bonestell continues his narrative for the PIC magazine publishers in that architecturally tight printing . In plate III, the viewer continues to follow the rocket as it rises towards its maximum height of 500 miles above the Midwestern United States. The viewer is again looking towards the north at the Great Lakes, Canada and beyond. 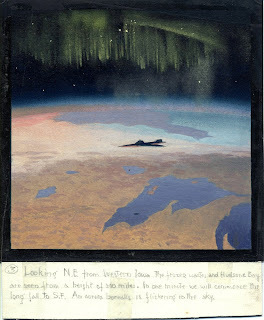 Bonestell takes in the curvature of the Earth, the thin veil of our atmosphere (accurately for a time of no satellites) and we see the Aurora Borealis portrayed for the first time at eye level instead of viewed from the Earth's surface. The rocket has reached it's maximum height of 500 miles above the Earth's surface. The passengers can now look to the south and see the Gulf of Mexico. The clusters of lights represent the cities of New Orleans and St Louis on the Mississippi River. The rocket is winning its race with the sun as it leaves the terminator behind over the Mississippi River and is returning to daylight. 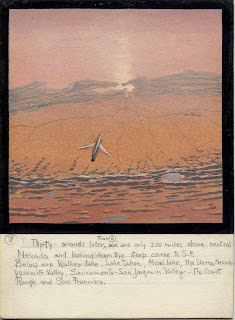 Bonestell shows us in Plate V a westward view of the country from the Rockies to the Pacific in the far distance. With the Rockies in the foreground, the passenger ship will continue its travel across the country passing over the Salt Lake in Utah. The large river structure in the left of the painting is the Grand Canyon as seen from 500 miles in space. One interesting note about these paintings is the lack of clouds. This was a time before weather satellites or any real photographs of the Earth taken from space. Bonestell based his knowledge of the Earth's atmospheric effects on his observations of cloudless days. As the rocket descends, the viewer is given a view of the southwest to the Gulf of California and the Baja California peninsula. Directly below is the Grand Canyon and Lake Mead. 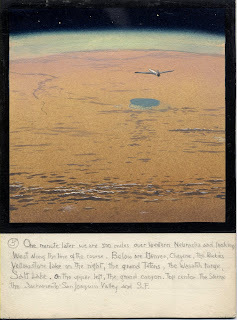 Bonestell uses his notes to go into detail about other landmarks to be seen in the painting. Plate VII shows the passenger rocket as it descends through 250 miles on the final leg of its remarkable journey. The rocket is over the Sierra Nevada Mountains. Lake Tahoe is on the right and Yosemite Valley cuts its way through the mountains on the extreme left. San Francisco Bay is now in sight. 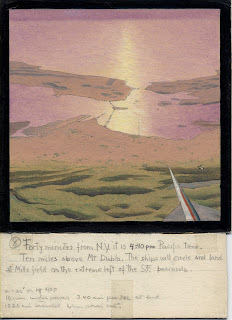 The eighth and final painting, Bonestell shows the rocket on final approach to San Francisco. Forty minutes have elapsed since the passengers left New York. The time is 4:40PM and the Golden Gate Bridge is now in view. The sun that had already set in New York is now beginning to set in the west in shades of purple and red. Now what was the reason used in the PIC Magazine story for this remarkable journey? A cocktail appointment! One of our passengers had dinner with with someone in New York at 6:00PM and planned to meet with someone else for cocktails at 5:00PM. Was it business? Was it a second date? Unfortunately, the article never tells us. We can only let our imaginations guide us as to the real reason for a trip from coast to coast in 40 minutes. There is another bit of information about this series of paintings. 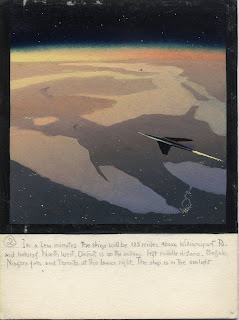 Chesley Bonestell used many of his paintings in more than one article or book. Four of the paintings for this series were used in the book "CONQUEST OF SPACE." Bonestell noted on the back of these paintings which works were used in that initial treaty on Man's journey into space. The above scan shows the back of the first painting in the series. 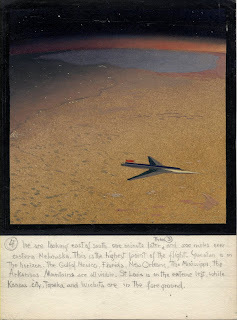 There Bonestell writes, in script, the name of article, the magazine and the edition date and states that this painting was "also reused as Plate I, CONQUEST OF SPACE." Chesley would go on to note that paintings 2,3 and 6 would be reused as Plates III, IVa and IVb in "CONQUEST OF SPACE." This series of works by Bonestell were used in one of the first published articles by the artist as well as included in one of the most important early books on space travel for the general public ever written. 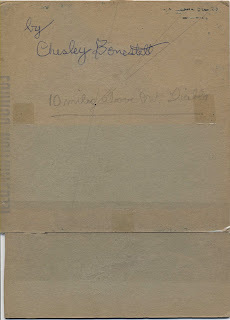 Later in life Chesley would sign the eighth and final painting of this series as shown in the above scan. I would like to acknowledge Melvin Schuetz and Ron Miller for alerting me to this rare series of Bonestell paintings and for providing me with much information about Chesley Bonestell and his art.